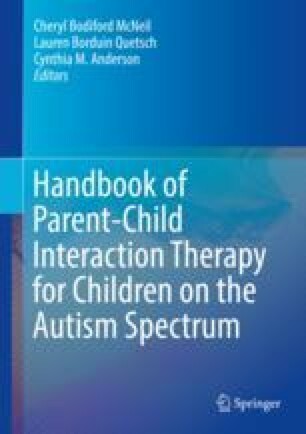 The present authors constructed a randomized controlled trial and demonstrated the efficacy of Parent-Child Interaction Therapy (PCIT) for children with higher-functioning autism spectrum disorder (ASD; Solomon, et al. Journal of Autism and Developmental Disorders, 38: 1767–1776, 2008). Our study filled a gap in the literature, promoting the use of parenting interventions designed for typically developing children in the population of higher-functioning children with ASD. The purpose of this chapter is to review and critique the choices we made, our findings, and conclusions, examining them with the benefit of current research and information about ASD interventions, PCIT, and research targeting the use of PCIT with children on the autism spectrum. We will briefly review our 2008 study, then discuss in more detail certain decisions and outcomes that we believe still have an impact on how PCIT currently is provided to children with ASD.